Marketing Innovation for the Future | Commit Marketing | A Full-Service Marketing, Web Design & Development Firm Located In Sarasota, FL. In the past few weeks, some big things have been happening in the world of visual technology. While, some of the technologies I will mention have existed, their applications and use seem much more practical. If you have been keeping up with the news then these next few paragraphs will be a bit of old news, but relevant nonetheless. 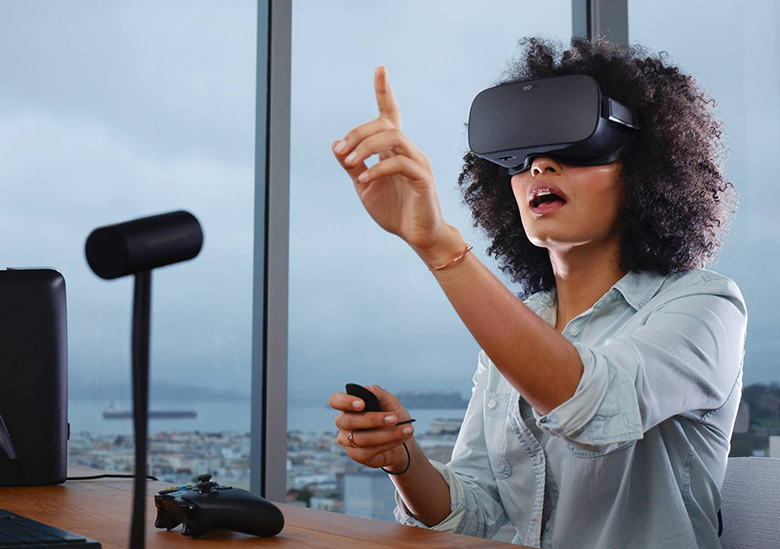 This all starts back in 2014 when Facebook purchased Oculus Rift, a cutting edge virtual reality platform, officially released in March of this year. Oculus Rift, according to their website, is a way to immerse yourself in games or go inside your favorite movies. Time travel, space travel, or hang out with friends in VR. The next piece of tech is Microsoft’s Hololens, which they announced in January of 2015. Microsoft HoloLens is the first fully untethered, holographic computer, enabling you to interact with high‑definition holograms in your world. This is codeword for augmented reality, which is a live, direct or indirect, view of a physical, real-world environment whose elements are augmented by computer-generated sensory input such as sound, video, graphics or GPS data. In recent articles, Microsoft has been demonstrating its use in the social media world. The Hololens has led to Microsoft’s much-hyped new augmented reality (AR) headset, but details have just been released about a cool new feature coming to the hardware called ‘holoportation’. Basically, it lets you jump into someone else’s reality as a full-sized, three-dimensional hologram, just like in the movies. So if you’re having a business meeting, for example, remote staff members can appear in the same room together, or if you’re having a video call with grandma, she can stand right in front of you rather than appearing on a flat laptop screen. It feels like technology straight from the future, and it’s coming soon to an AR headset near you. Further to the point of augmented reality, Google has been very active in this space. Most people, by now, have heard of Google Glass, which was a failed Google project. However, just because Google Glass failed does not mean Google is giving up. In fact, Google has announced that their main focus is augmented reality. Google reportedly doesn’t believe that in the public eye, people will be willing to invest in virtual reality solutions that force them to wear massive headsets, such as the Oculus headset or Gear VR. The company thinks that there’s a much bigger profit opportunity in the long run in augmented reality versus virtual reality. Google is rumored to be looking at bringing augmented reality to its camera app. If that’s true, the company would leverage technology from Google Goggles, allowing you to see relevant search results like nearby restaurants, transit information, and recommended retailers. It has been suggested that the integration would include a new feature “allowing users to outline specific areas of the image” in order to directly target their searches. This would be an improvement on the current iteration of Google Goggles, which only allows you to search whole images. How can this be a game changer? This was said when the internet was first born and when we were first introduced to the iPhone (smart phone). New applications of technology, as well as new technologies, produce new ways that we view marketing. Before Google, no one would have ever thought that advertising on a search engine would have been as lucrative as it has been. The same goes for Facebook and Twitter advertising. Can VR and AR really be the logical next step in marketing? I believe that it absolutely will be. Imagine the remote office scenario of Holoportation, and in the middle of the conference room table is a bottle of Coca Cola that is being digitally placed through AR. Or when you are walking through a VR or AR world, display ads appear when walking in front of buildings or signs. These applications take the theory of impressions to the next level, because it will all be measurable. I wouldn’t be surprised if we started seeing these technologies appear in the work place in the next 2 years and in homes within the next 5. Which we all know means that if it is in every home, it becomes a marketing avenue for everyone to explore.